Peckinpah's Mexican tragedy is a masterclass in character study. With Warren Oates in a rare lead performance, the protagonist's motivations are ripped open and shoved in his face in a profoundly sad manner. Oates is absolutely wonderful in portraying this man who has lost everything and, literally, has nothing else to live for. If this nihilism wan't enough, add Peckinpah's characteristic grime and violence to a setting that feels foreign but extremely vibrant. It's ok, but honestly I don't see anything special here. Not much different from usual grindhouse flick of its time with similar production and acting value. Slightly overrated, probably just due to director's name. This film is a good, straightforward action flick; not boring, not too stylized, with a mean undertone. Peckinpah's nihilistic streak was pushed to new levels of extremity in this scuzzy low budget feature which is a serious, if blackly humorous, character driven piece with the veneer of an exploitation film. Because expectations can be misleading, it's a difficult film to assess, especially given its oddball tone, but Oates is great as Bennie, a broken and desperate man looking for a way out of his dead-end life, and Peckinpah's authentic feel for place adds plenty of rough-hewn charm and grit. A mexploitation of exploitations? 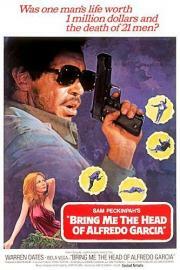 It has to be Sam Peckinpah, and Bring Me the Head of Alfredo Garcia's posters make both those facts obvious. Warren Oates might wanna be cool, but he's an aging poor bartender who lives in squalor with his prostitute lover. Problems aren't solved with a bullet and a laugh this time as Peckinpah frames a typical action movie setup around the true ugly, repulsively dirty world of crime. Oates plays one of the most interesting characters ever in a crime movie. This was pretty bleak and gritty, but I found it strangely enjoyable; blackly comical at points even. I really liked Oates in the main role, and the rest of the cast held their own. I definitely didn't expect the plot to go the way it did. Some of it left a bit of a bad taste in the mouth, but this is definitely worth seeing.